BroadLink® RF-IR Blaster Automation Hub: Need an easy phone app system? Take a look at our affordable blind and shade hub, operated by Android and IOS apps. This RF-IR blaster hub can "learn" RF radio signals for our blind motors and skylight/window openers, including x10 RF radio signals! It is also has IFTTT event triggering (if-this-then-that) and IR learning. x10 home automation systems (and other brands) can be easily interfaced with our RollerTrol™ motors (shown on left) to control windows, window blinds and shades, vents, skylights and any other item you would like to move with a motorized roller or actuator. If you have at least a rudimentary knowledge of what a home automation system is, we'll show you how the ActiveHome Pro x10 system sends control signals over the AC power lines and directly throughout the home with radio signals. The x10 home automation system is without a doubt the most cost effective, affordable approach in the marketplace. The downside is that it can be subject to false triggering, so you would want to be careful about what you use it for. Please Note: You do not need to use the PC software if you just want a remote control system for various devices. The ActiveHome Pro interface acts as a stand-alone radio transceiver to receive control signals from the remotes, without being plugged into a PC! You can quickly set up your RF control system without connecting to a PC and add the software component later. The software adds functionality such as timers and response to designated conditions and sensors. (2.) Roller Shade Motors - add as many as you like, and use them in different ways (not just for blinds). The x10 home automation software allows you to use your PC to control motors for blinds and shades (and anything else, see our x10 irrigation system). 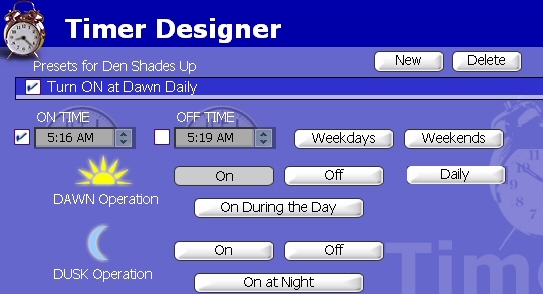 Examples of the user friendly switch and timer screens are shown here; note that you can program a timer to stop the blinds anywhere you want, with as many preset shade positions as you need. This is a very easy to use interface with full drag and drop capability, and you can turn motors on and off simply by clicking on the switches. As we develop this article series, we'll show you how to use x10 control signals to raise and lower your blinds and shades (or open and close windows, or move anything else you can think of). You are also not limited to using it just for blinds or shades - you can control irrigation, lighting, appliances, sound systems, security, and anything else that comes to mind. The ActiveHome Pro Software (A) runs on your PC and provides user friendly screens for organizing rooms and general functions, including timers and sensor reaction procedures. Blind & shade motor control is only a small part of what you can do! You then download your settings via USB to the microprocessor module (B) and disconnect when done. If you stay connected to the microprocessor module, you can also control blinds and shade motors directly from the screen, anywhere in your home, if you prefer. The stand-alone microprocessor module (B) stores your software settings via USB, does not require PC to be connected while operating normally. It issues commands over the powerline to control modules plugged in somewhere else in the home. 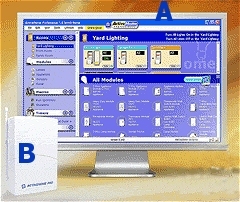 It is typically located near a PC so it can be easily adjusted and re-programmed by the ActiveHome Software (A). The stand-alone microprocessor module (B) also contains a radio receiver that accepts and re-transmits RF commands from radio-type external remote controls, including coffee table and wall mount wireless types (note the receiving antenna on far left of picture). Remote control radio signals travel easily through walls, and do not require that the remote be aimed at the device to be controlled. Motor controller module (C) with relay modules (D) and power supply (not shown) operate up to 8 blinds simultaneously in a group. They can be concealed and tied into a single power bar anywhere you choose. You can also stop the blinds at any point (infinite preset positions). The low voltage DC motor control power is safe for children and adults, and you do not need to be an electrician to install this system. The self-adhesive wall switch (E) with radio transmitter controls 1 group of blinds or shades (no wires required). Simply peel and stick the switch at an appropriate place on your wall. This provides manual over-ride of the blind group with UP, DOWN and STOP motor control functions. The included button battery easily lasts for several years. The coffee table remote control (F) operates up to 5 groups of blinds that may or may not be in the same room. It can control other items such as lights, or anything else you have set up in your home. You can choose which included tubular motor (G) of choice you want, depending on the requirements. These motors are very quiet and efficient, typically using less than 10 watts of power. All of the above (except our motors (G) and controller(C) ) can be purchased at x10.com, all you have to do is plug in the controller and interface, load the software, and it will work ... it doesn't get any easier than that! Please note that this universal interface kit for home automation systems will work with any other system such as Z-Wave®, Zigbee®, Insteon®, Crestron® and Control4®. Any home automation system that has dry contact output (ie relay capability) will work with our product. All it requires is 2 switch closures for FORWARD and REVERSE. This kit comes with a motor, and will control one group of up to approximately 8 blinds, depending on sizes of motor selection. Add as many motors as you need, depending on the size of your window(s) and weight of your fabric(s).